Choosing a forum for disputes and a governing law can be one of the most critical elements to completing an M&A or JVA transaction. According the latest edition of the Middle East Deal Study 2017 released by Clyde & Co., English law remains the most popular governing law and is the preferred choice for 73% of M&A deals reviewed, and 70% of JV transactions. As the foremost English language common law jurisdiction in the region, it is therefore not surprising that over 60% of all M&A and JVA transactions chose DIFC as the preferred seat of arbitration. The report compiled data stemming from a compilation of 76 of the key M&A and JV transactions across the MENA region from 2015-2017. Of this total, 44 of the deals were M&A transactions with an aggregate consideration in excess of US$1.1 billion, while 32 of the deals were JV transactions, covering a broad range of sectors, from insurance, reinsurance, manufacturing, energy and real estate. Arbitration is still the preferred choice for dispute resolution, in line with global trends in international contracts, despite seeing a decline from 79% to 60%, which indicate parties getting more comfortable with litigation, primarily in the DIFC Courts. 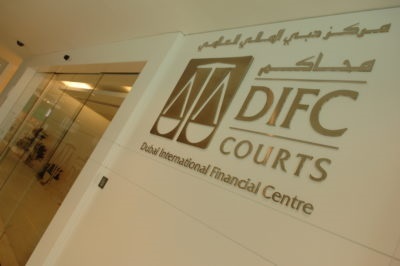 Of the deals where litigation in court was the chosen forum for disputes, 76% chose DIFC Courts. This is a 29% rise from the last survey, representing a 162% increase, indicating the substantial rise of the DIFC Courts, taking over from the UK Courts as the preferred court system for M&A activity. Where parties choose arbitration, 84% choose DIFC-LCIA, up from 55% on the last survey. This is a 53% increase from 2015. For parties which choose litigation, there is a massive rise in the preference for DIFC Courts, from 17% in the last survey to 50% in this survey (a 194% increase), making DIFC Courts the preferred court, overtaking the UK Courts.